Apparently, according to Eva, the idea of God being an old man with a beard who smites people is an “extreme belief” held both by atheists who think that all Christians see the bible as being literally true and by Christians who actually do see the bible as true. Those of us who haven’t jettisoned reason and common sense in order to believe in nonsensical fairy tales, and still have our faculties of critical thinking and reason intact will see through this obvious smear of “atheists”. Atheists don’t anthropomorphize gods, theists do. The idea that “God” is a “him” with a beard, who smites people doesn’t come from people who don’t believe that such a being exists in the first place. I have heard people say some really ignorant and stupid things in my life, but I think this one might take the cake. 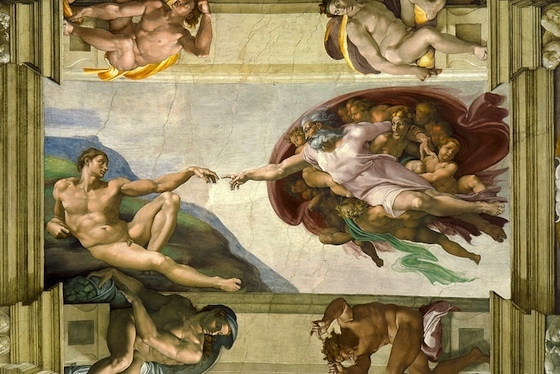 I wonder if this painting located on the ceiling of the Sistine Chappel, the official residence of the Pope (the Vicar of Christ on earth), done in the early 1500’s, approximately 100 years before the King James Bible was written, has anything to do with people’s perception of God as an old man with a white beard? I dunno. Maybe? Hard to say. Furthermore, the idea that there is only one “God” is certainly not a concept held on to anyone who studies history and religion and mythology. Anyone who looks into the matter will know that there have been hundreds and thousands of gods who have come and gone in the course of human history. He/She/It is figment of your imagination. A fairy tale. An unfulfilling and ultimately useless catch all answer to complicated questions and mysteries that appeals only to the inculcated, the ignorant and the incurious. So instead of reading about horseshit made up out of thin air, it’s probably better to get your info from a genuine source. Now I certainly don’t claim to be the only genuine source or that I pretend to speak for all atheists, but I do feel I am in a much better position to describe what atheists think about when the word “God” is mentioned than Eva ever was or ever will be. I’m Smart and Humble, Have the Mystery of the Universe Figured Out – And Anyone Who Challenges Me Will Not Be Tolerated! Irony can often be a great source of entertainment for me and I get plenty of it while reading and commenting on various blogs. The latest dose of it came while reading posts of one particular individuals blog, and then his comments on another blog. I had such a good laugh, I figured I’d make this into a quick post. You would think that someone, who is so knowledgeable that he has the mystery of the entire universe all figured out, would be a little reluctant to call others arrogant! You’d also be a little surprised that such a person would be so intolerant of other’s views, but even so, we all have our faults. But to complain that he’s been banned on other people’s blogs? That’s just too rich for me to resist sharing! I know it’s only been a few days since my last post and I don’t want to “overload” anyone, but I had posted this on tildeb’s blog and figured I’d make a post out of it here. I feel that it’s a very handy guide to identifying the tactics of the Religious Apologist. Feel free to message me if you think something needs correcting and/or additions are required. Step 1) Intentionally misrepresent any agnostic/atheist/secular viewpoint to start the smear. Do your best to generalize. Step 2) When/if called out on it, blame any offence taking/misunderstanding on everyone but yourself – point out that the person reading the aforementioned misrepresentative garbage and lies has likely “read it the wrong way” or “taken it too much to heart” and that they just need to “lighten up”. Step 3) If you must admit to doing something wrong/unethical/immoral, back pedal if you can. You don’t have to, but it doesn’t hurt. Then offer a half hearted apology and make sure you put lots of qualifiers on it. So many qualifiers in fact that it becomes essentially meaningless. Step 4) At all costs, avoid discussing the actual reason for the calling out (i.e. the actual lies/misrepresentation/etc). NEVER, EVER admit that you might have lied or misrepresented other people’s view points or even that you meant what you actually wrote – if the conversation doesn’t end there and the other person tries to continue it – go back and repeat steps 2 and/or 3. Step 5) If the conversation STILL continues, turn it around on the person accusing you of spreading lies and misrepresentative garbage. Tell them they’re an “angry atheist” who needs to “get over themselves”. Remember – this is NOT your fault. You didn’t do anything wrong. They’re just being hateful. Step 6) If the other person still tries to continue talking about it you can a) ban him/her if it’s your own forum or b) stop replying if it’s a forum not controlled by you. Additional tactics – to be used at the discretion of the religious person, depending on how much of this bunk they actually believe. A) Don’t be afraid to let your sense of superiority shine through. It’s ok to talk in a condescending way to the atheist/agnostic/secularist. Your reasoning skills and grasp on logic is far superior to those guys. After all, you’ve got the mystery of the entire universe all figured out. What the hell do these people know?! Don’t forget, you have the moral high ground. You know where morals come from and who gave them to you. These guys are just base animals that would kill you at the drop of a hat because they don’t believe they have anyone to answer to. B) Feel free to tell the atheist/agnostic/secular person that their immortal soul is in grave danger because they haven’t accepted the One True God as their lord and savior. Don’t be afraid to tell them that they are going to hell – hopefully that will scare them into doing the right thing. After all, you really are just doing them a favour. However, some of them are so wicked and evil that they won’t listen to you. That’s because they are devil worshippers. There’s nothing you can do about that. Don’t worry, God will fix their wagon in due time.